Astronomie - Where is the Universe Hiding its Missing Mass? Mars-Chroniken - Could Volcanic Activity Allow Water Beneath the Martian Polar Ice? Raumfahrt - Is GSLV MK-3 fully ready to launch heavy satellites from India? Astronomie - Aluminum may be key to making exosolar systems with water worlds Radioactive aluminum could control water content of planetary building blocks. Seating is limited and is available on a first come, first served basis. Meet PUFFER—NASA's pop-up origami rover. Currently, rover missions face serious limitations in extreme terrain. A rover like Curiosity is just too valuable to risk driving into a crater or upending on rough ground. PUFFER was created to work in parallel with larger rovers (or deployed off landers) when the landscape becomes too dangerous. These mini rovers fold flat—down to about the size of a smartphone—so several can be packed on a rover. When deployed, they are ready to charge up steep slopes, drop into craters, or partially fold to crawl on their bellies into hard-to-reach places. Solar panels on PUFFER's belly allow it to flip over and recharge before returning to the parent rover. With PUFFER, JPL hopes to offer a low-profile, low-cost solution to enable future missions to investigate more varied and extreme terrains. The design team took inspiration from origami to design PUFFER's body, which is made of folded layers of printed circuit boards. This allows the expendable tiny rovers to carry miniature science instruments such as high-resolution micro-imagers, organic molecule samplers, or spectrometers to study the chemical makeup of other planets. PUFFER has been tested in some of Earth's most challenging environments, and its designers at JPL hope to see it hitching a ride to new destinations in the solar system sometime soon. 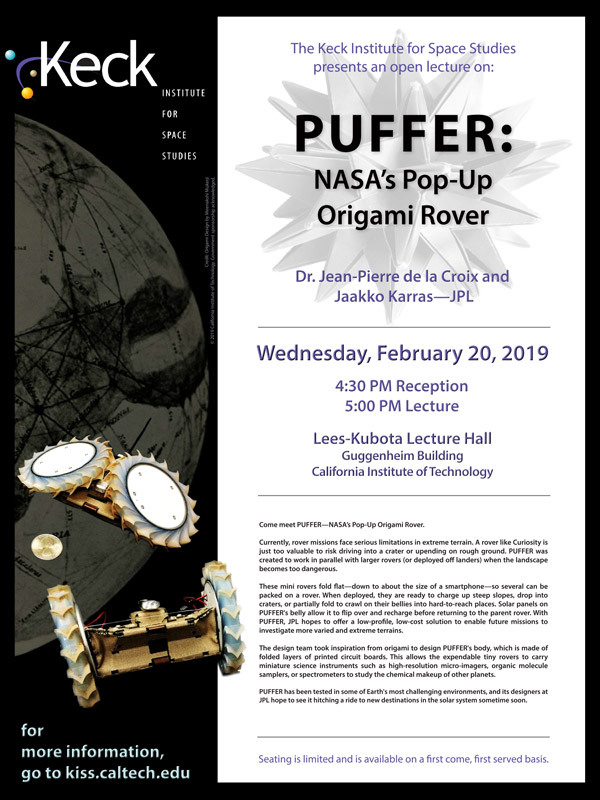 Come talk all things PUFFER with project developers Jaakko Karras and Dr. Jean-Pierre de la Croix. Dr. Jean-Pierre de la Croix is a Robotics Systems Engineer in the Robotic Systems Estimation, Decision, and Control group. He joined JPL after completing a Ph.D. in Electrical & Computer Engineering at the Georgia Institute of Technology in 2015. His research focused on new control techniques for large-scale robotic systems, such that humans can easily and effectively interact with these complex systems. At JPL, he continues to work on multi-agent robotics for new and challenging applications. Jaakko Karras received an M.S. in Electrical Engineering from U.C. Berkeley, where he worked on tactile sensing for origami-inspired legged robots under the guidance of Prof. Ron Fearing. Prior to Berkeley, he attended Harvey Mudd College, graduating with a B.S. in Engineering (with emphasis in Electrical Engineering and Computer Science). Jaakko has developed electronics and software for robotic systems on both flight and research projects. He has also led development of the JPL PUFFER pop-up rover technology. Jaakko is currently working on the Mars Helicopter and Autonomous PUFFER projects.